It was a long day yesterday. It seemed as though I went out on a physical exercise spree. I had to walk long distance from one garage to another before boarding buses. I didn’t mind though, since exercise is good for the body they say. I was soon tired 😴 out, hence the late post! Ok on my way back from Egbeda area of Lagos State, I boarded a bus 🚌 going back to Agege from Iyana-Ipaja. We had a smooth ride until we got to Agbotikuyo area where LASTMA official flagged down our bus. 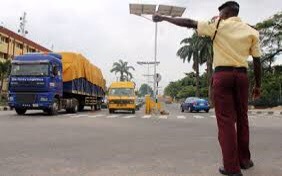 The driver did not use his seat belt until he noticed LASTMA officials at the T-Junction, but apparently, the official had the eye of an eagle. To cut the long story short, the driver refused to succumb to the request of the officials to park well (he obstructed traffic a bit). Omo, the driver just resorted to blackmailing the officials o. He kept shouting atop his voice, “Wetin I do? You no see me wear belt? … “na only me?, since the past two weeks, I don be una victim” “I no get family for house? Wetin?” He kept lamenting. Pointing to one of them, he continued “na so this one tell me say I go see, say e go show me for this road…” ” I no dey go anywhere today”. We, the passengers pleaded that he should get us off at the bus stop. He declined completely. I guess he knew if he moved an inch another 20k go drop be dat. Remember Friday is a holiday and officials gas chop na. Lol. As a matter of fact the driver got down from his seat 💺, pocketed his bus keys and said he wasn’t going to move an inch except he was allowed to go free. I think he figured the only way out was to play dirty. Some passengers already found other means. I waited a bit in the bus because I was fagged out. When I figured the ‘serenren’ won’t be over soon, I took the next available bus. To my chagrin, by the time I almost got to the bus stop, I saw the two LASTMA officials who had done us a disservice earlier. I was aghast, what the ** (In this economy, they made me pay extra, if not much..)! But then I was glad the driver prevailed. Not that I condone his acts but some LASTMA officials are lawbreakers themselves, and partial in the rendering of their duties. LASTMA officials are ‘two-faced’ lol. If not that I’ve seen some hardworking and loyal ones amongst them, I’d have concluded LASTMA is a fraud!! !